Trade disputes have roiled commodity markets and created substantial uncertainty about the impact on agricultural exports, especially to China. China’s response to the Administration’s proposed tariffs included tariffs on U.S. soybeans exported to China, and prices for soybeans have fallen dramatically (Farm Policy News, July 15, 2018). Price declines raise questions regarding whether revenue-based crop insurance policies will make large payments in 2018. Price declines raise the chance of indemnity payments on revenue insurance policies and, if large enough, could result in loss ratios above 1.0. It is more likely, however, that crop insurance indemnity payments will be less than total premiums paid on crop insurance policies, particularly if soybean yields this year are relatively high, as expected given current conditions. Most importantly, large soybean insurance indemnities will indicate that incomes on Midwest grain farms will be low. In Midwest States, around 75% of the corn and soybean acres planted are insured with Revenue Protection (RP), with over 50% of the acres being insured at 80% and 85% coverage levels (see farmdoc daily, January 23, 2018). RP is a revenue insurance policy that triggers an indemnity payment when harvest revenue is lower than a revenue guarantee. The revenue guarantee equals the chosen coverage level times a guarantee yield times the higher of the projected price and harvest price. This year, the harvest price likely will be below projected price, causing the guarantee to be based on the projected price. Large payments could result from RP if the harvest price is well below the projected price. 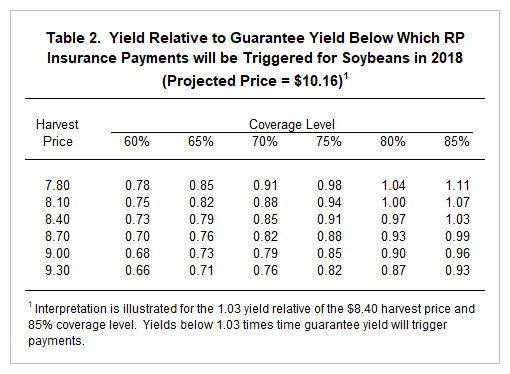 Of course, yields relative to guarantee yields play a role in determining the size of crop insurance payments. For Midwest states, the 2018 projected price is $10.16 per bushel for soybeans (farmdoc daily, March 1, 2018). 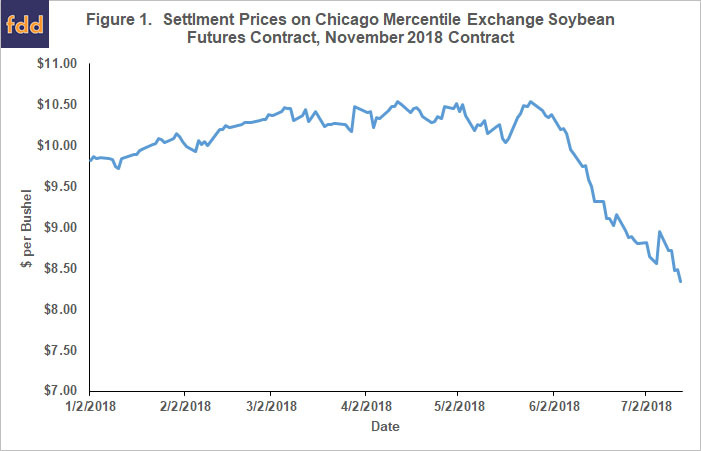 This projected price is the average of settlement prices on the Chicago Mercantile Exchange (CME) November soybean contract during February. Useful indicators for evaluating whether crop insurance policies may pay are break-even prices, which can be calculated using the projected price times the coverage level of the crop insurance policies (see Table 1). 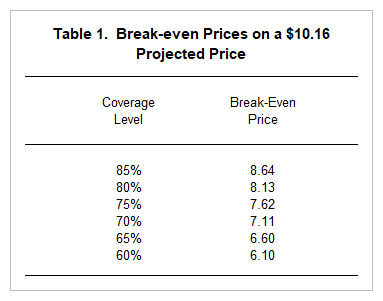 The break-even price for an 85% RP policy for soybeans is $8.64 ($10.16 projected price x .85 coverage level) if yields are at the level of the guarantee yield. RP will make payments when the harvest price is below this level and yield from the insured unit does not exceed the yield used to set the revenue guarantee. Moreover, yields higher than guarantee yields could result in low payments. To illustrate, Table 2 shows yields relative to guarantee yields below which RP will trigger payments. Take an 85% coverage level and an $8.40 harvest price. The yield relative to guarantee yield is 1.03. If a policy has a 50 bushel per acre guarantee yield, a yield below 51.5 bushels per acre will not trigger payments. In recent years, soybean yields have been significantly above trend (farmdoc daily, March 20, 2018, and farmdoc daily, October 25, 2016), with Illinois state soybean yield being over 4 bushels above trend every year since 2014. If soybean yields continue above trend in 2018, soybean RP policies will not make large payments at an $8.40 harvest price, even at an 85% coverage level. Current growing conditions over much of the nation indicate the potential for high yields, indicating that above trend yields are possible. Arguably more importantly, large soybean crop insurance payments will indicate very low farm incomes. As discussed previously, yields will need to be well above trend for 2018 grain farm net incomes to approach the 2016 -2017 average levels (farmdoc daily, July 10, 2018 and June 26, 2018). Even at $8.40 harvest price, yields will need to be near or below trend before crop insurance payments will occur. Yields that are below trend, however, mean that farm incomes will be even lower in 2018. 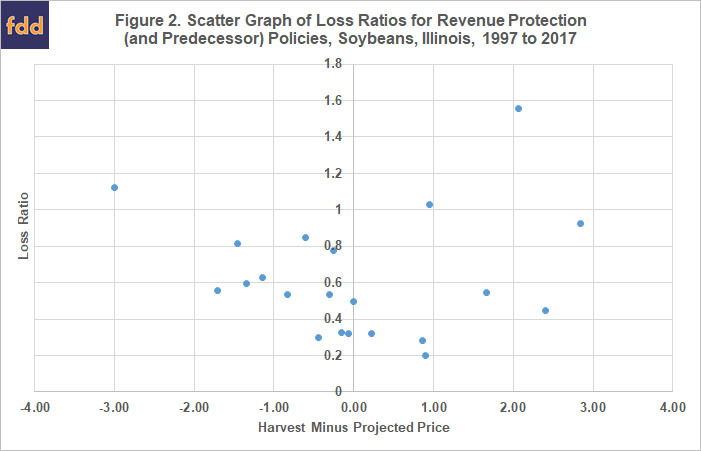 Crop insurance payments could provide a backstop against very low incomes, but will not offset the losses being experienced by grain farmers this year due to soybean price declines.